Last week, George King participated in a Denver Nuggets pre-draft workout for his second-consecutive year — only this time, it counted. King participated in the pre-draft process last year before heading back to the University of Colorado for his senior season. The 6-foot-6, 225-pounder averaged 12.9 points and 7.9 rebounds in his final season and knocked down 39 percent of his shots from beyond the arc while also leading the team in rebounds. 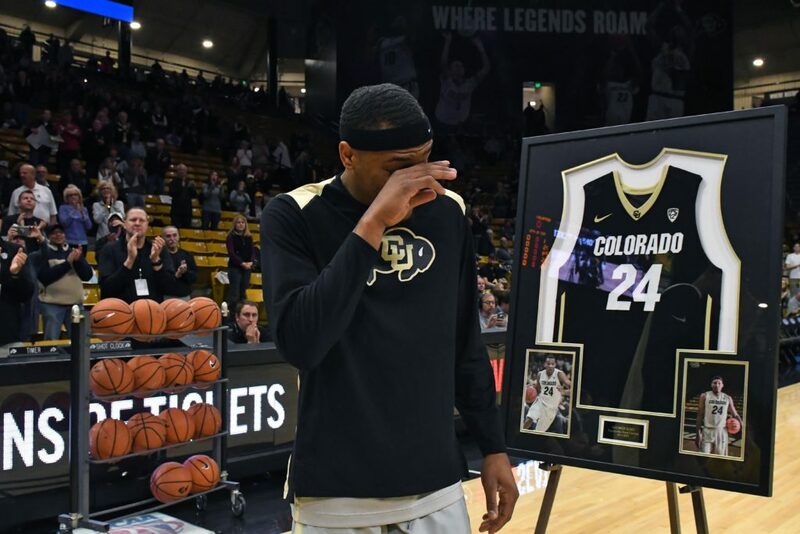 He was the 34thplayer in CU history to reach the 1,000 point plateau, received the Most Improved Player award in 2016 after emerging from a red-shirt season, and he landed on the All-Pac-12 second team this year. To continue bettering his stock, King also had a strong overall showing in the Portsmouth Invitation Tournament in April. In three games, he averaged 18.0 points, 7.7 rebounds and a block which showcased the type of player that he is and helped him gather some extra positive momentum heading into the draft. This was clearly the most important summer of King’s life and he started receiving more and more attention as it continued. He’s been invited to multiple NBA draft workouts and also participated in the 2018 NBA draft combine where he was able to showcase his talents as one of 69 college players invited to play and workout at Quest Multisport in Chicago, Illinois. King getting invited to the combine made him one of only the four Buffaloes’ player since 2013 to receive an invite and all three of the others — Andre Roberson, Spencer Dinwiddie and Derrick White — are currently in the NBA. For King, it may not be that easy and he may have to find an alternate route into the world of professional basketball. With only nine more days before the NBA draft, despite two great showings at separate showcases and also an appearance at the NBA combine, he still seems to be off of the radar and not expected to be drafted. “I haven’t gotten that much feedback at all honestly, I think they’re keeping it kind of subliminal,” King explained when asked about feedback from front offices. King then went on to discuss the possibility of him playing overseas. “If the overseas option is better than what my options are here in the states, then I’m going to sit down to talk with my family and with my representative, but, until then, I’m going to keep going and chasing my dream to play basketball at the highest level,” King explained as he assured the media that his goal is to play in the NBA. Of the many players that Denver has had in for pre-draft workouts, many will get drafted and, if King does not get drafted, there could be a perfect opportunity that could present itself for King on his one last ditch effort to showcase that he’s a player ready to help an NBA team. As of now, if you take a look at Denver’s roster, the only players that could benefit from some summer league run is Monte Morris, who is coming off of his rookie season in which he spent most of his time in the G-League, Malik Beasley, who should dominate for a game or two based on sheer talent, and Tyler Lydon, who just went through 5-on-5 work for the first time since being tearing his meniscus which kept him out for most of his rookie season. Head coach Michael Malone also says that the team also hopes to have draft-and-stash second-rounder Vlatko Cancar on the team, but he has a few national team commitments that could keep him from playing in Vegas. King says all that he needs is an opportunity and what better opportunity is there than getting a shot to play at Summer League with Denver, who need to fill out their Summer League roster? Time is ticking and if King doesn’t hear his name called come June 21st, he will start a process that many face — fighting for professional basketball relevance.